Think the PPC playing field is too uneven to compete? Wrong. Small companies absolutely can compete against big brands. Find out how here. It isn’t easy to compete against big brand advertisers in PPC. They have deep pockets, large in-house marketing teams, and contracts with high-priced ad agencies. As a smaller competitor, you might conclude that the advertising playing field is simply too uneven to compete. While you may not be in a position to buy full page print ads in national newspapers or produce commercials for TV, pay-per-click (PPC) marketing is a channel that still allows small advertisers to play on the same field – if they know how. In this article, I’ll give you some tips on how to compete against big brands in paid search – using one anonymous advertiser as an example. In the face of overwhelming competition, the tendency is to ignore what your competitors are doing and strike your own path. Although you won’t necessarily want to go head-to-head with them, you should still have an awareness of what they’re up to, especially in terms of their online promotions. As you can see, this search returned four ads. The top ad is for our anonymous garage storage system company, which we’ll call “Small Garage Co.” for simplicity. The remaining ads are for big brands competitors: California Closets, Lowes, and Home Depot. From these ads, we see that California Closets is featuring 20 percent off selected finishes. Home Depot is offering 30 percent off its storage solutions. Judging from its ad, Small Garage Co. isn’t running any promotions. But in fact it is! When you click on the ad and visit its site, we learn that it’s running a summer promotion of $250 off garage cabinets and flooring! Why isn’t this information included in the ad? Especially when their competitors are running promotions? This isn’t to say that Small Garage Co. has to match the big brands on discounts or promotions. Ideally, it should offer something. But to do that it needs to know what its competitors are doing and strategize accordingly. Higher prices and less attractive promotions aren’t necessarily a deal breaker, especially if you’re offering higher quality or better support. A good portion of the market will be willing to pay a higher price to get what they want. The above example illustrated the importance of monitoring competitors and communicating promotions. Now, let’s take this point further. They state they have “10+ years of experience.” Again, this might not count for much when competing against well-known brands. 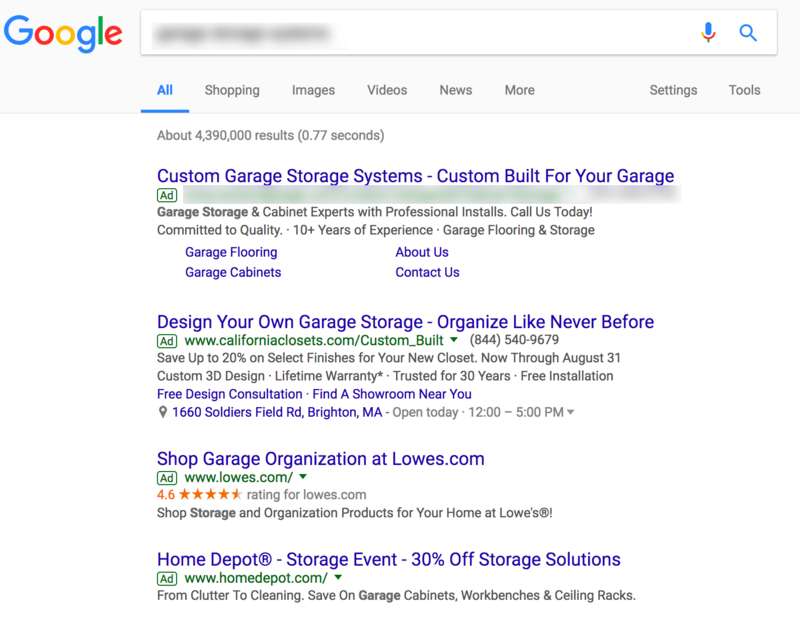 They repeat “garage storage” and “garage flooring” multiple times in the headline, body copy and sitelinks, which is a little redundant. And their “About Us” and “Contact Us” sitelinks are another wasted opportunity. What could they have done instead? They could have communicated their competitive advantages over big box retailers. They’re a local company (i.e., local to my location near Boston). Many people prefer to support local companies rather than big national retailers. They specialize in garage flooring and storage systems. They don’t offer unrelated services, such as bathroom renovations or heating system replacements. Their products have a lifetime guarantee! They provide a free onsite consultation to measure your space and give recommendations. Installation is done by the company itself. They don’t subcontract the work out. They offer additional garage-related services, such as garage painting, onsite storage units (to store your things during install) and garage lighting. But unless you clicked on the ad and dig into the company’s site, you would never know these things! This may seem like a lot of messaging to stuff into one ad. But I’m confident that a skilled PPC team could do it by making smart use of all ad elements, including headline, body, sitelinks, callouts, and structured snippets. Know what your competitors are doing. Be able to communicate those differences in your ad messaging. Monitor your data and test like crazy to make sure it’s working. In most cases, I don’t think it’s reasonable to expect a smaller company – especially a company with no in-house marketing team or maybe a team of one or two people – to compete against big brands with high-end digital advertising agencies on their side. This is especially true with PPC advertising. PPC is in a constant state of change. Strategies and tactics that worked well last year may not work well today. Lessons learned in different markets or industries may no longer apply. In addition, advertising platforms, such as AdWords, change rapidly too. You may not have the budget to bring in a big-league advertising agency. But you may have the budget to bring in a smaller PPC agency or specialist and collaborate with them closely. By working together, you may uncover little tricks and tips that give you an edge. Working together, we came up with the idea of using the headline “[Company Name] – Official Site.” At first, I thought this headline too boring to garner many clicks. But to my surprise, the technique worked really well for this client and drove more sales. This is exactly the kind of little gem that a PPC pro can help you uncover. I can’t stress this point enough. If you want to compete with big brands, your website needs to have the look and feel of a big brand. You don’t need to deceive anyone. But you are trying to inspire confidence. And to inspire confidence, your site needs to be modern, mobile-friendly, functional, and look good. If your site hasn’t been updated in some years, now’s the time to do it. And then keep doing it! Put website updates and redesigns into your budget and keep them there. Today’s top website design will need to be updated in a few years as aesthetic preferences and functions change. Even if you write a killer ad that draws clicks, you’ll lose conversions – big time – if your site doesn’t build trust. If it sews a seed of doubt, “Who are these guys?” “How big is this company?” “Do they know what they’re doing?” you’ll lose the sale. In fact, you need to make sure your site has a big brand feel before getting into PPC advertising – even if that means foregoing PPC entirely for a period of time. Yes, you heard me right! You Can Play With the Big Brands! I hope I’ve convinced you that your company can compete against big brand PPC advertisers. You simply need to keep an eye on the competition, communicate your competitive advantages (preferably working with a PPC pro), and build a website that inspires confidence. It all comes down to knowing your market, products and customers — and then finding an edge you can leverage.